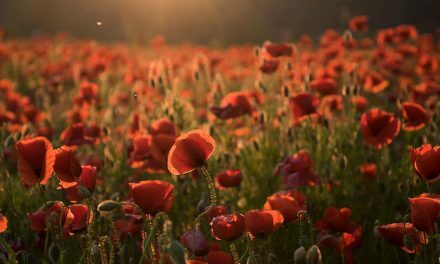 What is the essential Canberra? 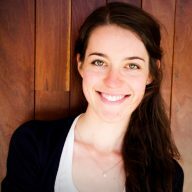 Lake Burley Griffin, the fountain, Telstra Tower and Parliament House are all places that come to mind. This venue has it all. 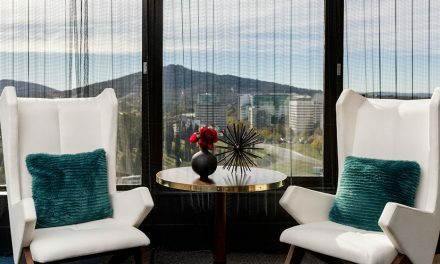 The Deck is the quintessential destination to soak in the sights of Canberra. 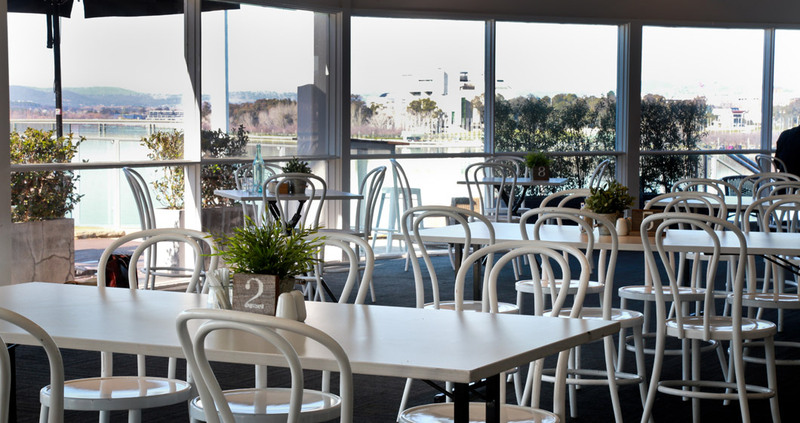 Set atop Regatta Point, the café offers panoramic views across the lake. On a nice sunny day, it’s a real treat to sit out on the deck, but inside also offers a bright and airy space for a relaxed experience. 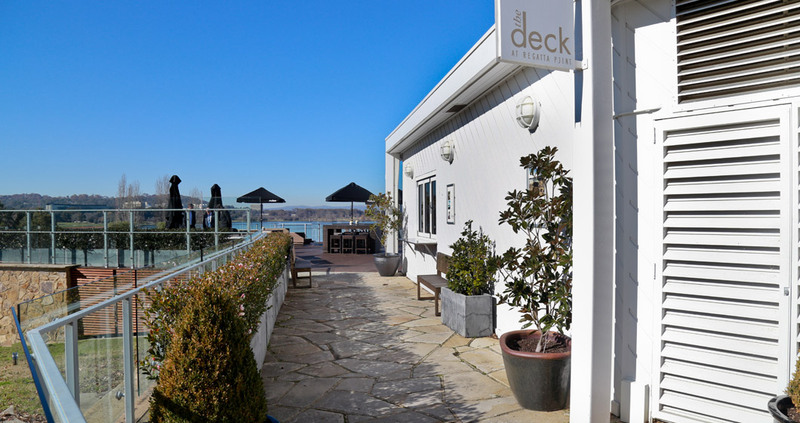 As it holds such a prime location in Canberra, The Deck is an alluring place for everyone. 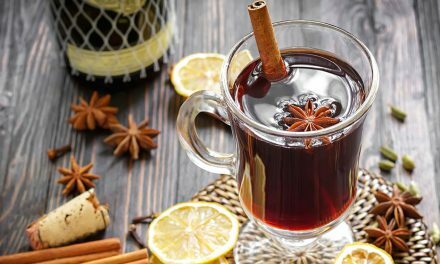 Here you can find all of the café classics to satiate any appetite, but The Deck is also passionate about doing it with a refreshing healthy twist. With an all-day breakfast menu and extensive lunch options, the only difficult part is knowing what to choose. If eggs are on the cards, then don’t look past the Mexican Grill. Soft and fluffy scrambled eggs spiced with onion and sweet red pepper cascade over a slice of grilled sourdough. 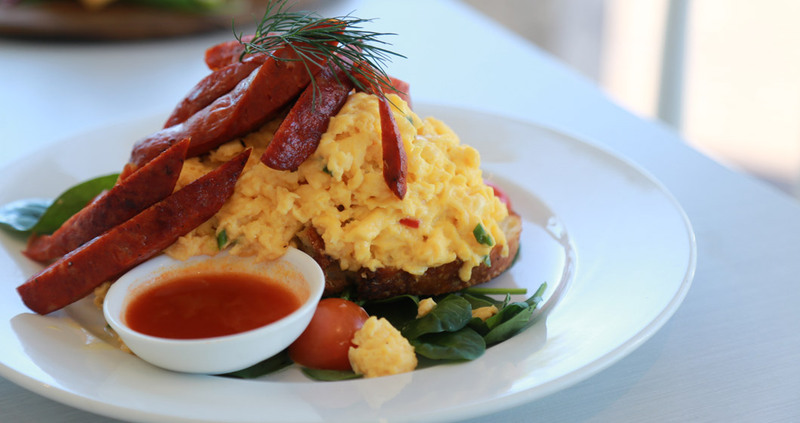 The rich cheesy-ness of the scrambled eggs is enhanced by slices of succulent chorizo sausage that add some spice and heat to the dish. If the slight heat of the chorizo isn’t enough, it’s also served with a side of Tabasco sauce that’s not for the faint-hearted. 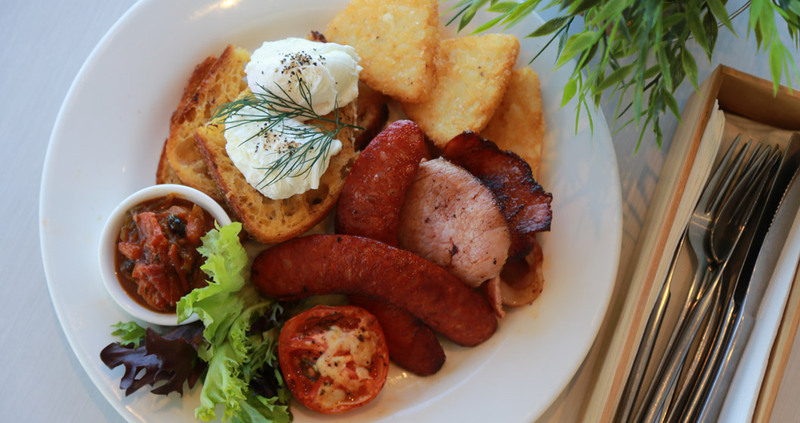 The Full Deck on the breakfast menu is a big breakfast with all the works. Perfectly poached eggs ooze over lashings of crispy bacon, smokey chorizo sausage, crunchy hash browns, slow-roasted tomato and buttery toast. This mix comes with a spiced tomato chutney that provides some sweetness and heat. Simple but rich, filling and satisfying. Is there anything more satisfying than a chicken schnitzel? 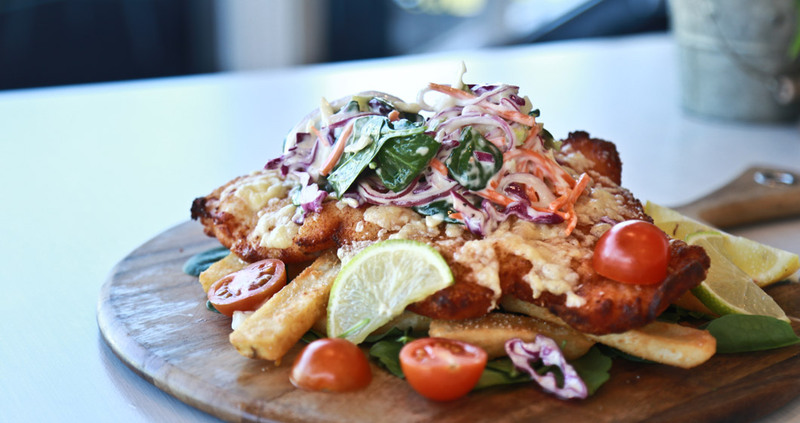 The Deck’s version of the Classic Chicken Schnitty will not leave you disappointed or hungry. The chicken schnitzel is deliciously succulent encased in a golden crust and topped with melted cheese. It’s perched on a pile of crunchy thick-cut chips and is served with fresh baby spinach, juicy tomatoes and crisp coleslaw to lighten up and revitalise the hearty meal – as well as adding a welcome tang to the mix. 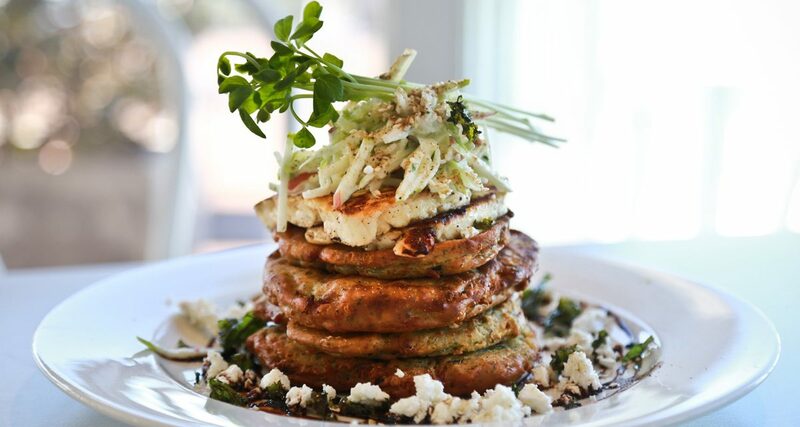 The Zucchini and Feta Fritters on the lunch menu is a medley of salty, sweet, spice and tang all in one. Fluffy on the inside with a crunchy, golden exterior, the fritters are mouth-wateringly aromatic, full of herbs and Mediterranean spices. Seared haloumi and crumbled feta provide a salty hit that is perfectly offset by a sweet and sticky balsamic drizzle, and the refreshing tang of a cumin-spiced apple yoghurt that tops the delicate stack. The Knickerbocker Glory on the dessert menu is the perfect way to round off a meal. Fresh and full of colour, it’s a revitalised ice cream sundae. Crisp apple, blueberries, strawberries and watermelon are layered with crunchy pecans in a jar, topped with vanilla bean ice cream and drizzled with a sinfully sweet berry coulis. A dessert to tempt both adults and children alike! 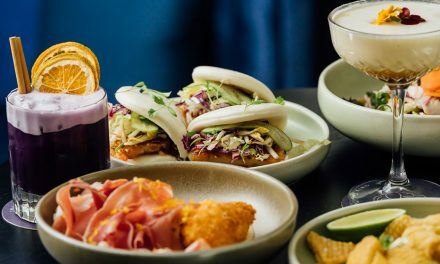 Whether you come for brunch, lunch or just a coffee, The Deck has something to offer everyone in the perfect Canberra setting.